Happy Halloween from Red Wing Software! This is Carole in her costume and Halloween-themed office! Have a great and spooky day! Accounting Software – How Much Can You Save? Have you ever wondered if switching software is worth it for you and your business? There is the cost of the software itself and training, not to mention the time investment. So, how do you know if it will really be worth all your time and money? Now there is an excellent tool where you can plug in real details about your business and see how much money you could potentially save. 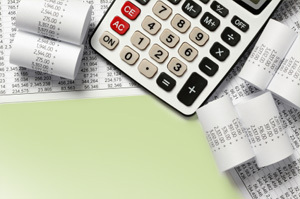 The tool was created by the accounting software experts at www.FindAccountingSoftware.com. Click on the link to give it a try for yourself! Setting up a time clock import in your payroll software basically consists of setting up a routine for the time clock to communicate with the payroll software. This routine you set up is called a time import definition. It tells the time clock (or other time collection device) which fields to import and bring into your payroll software. Once you set up your import definition and get it exactly how you want it to be, you can then import the time seamlessly each time you run payroll. Red Wing Software offers time import as an add-on purchase for CenterPoint Payroll Software. If you don’t use CenterPoint Payroll, ask your provider if a time import function is available. Setting up and managing multiple inventory locations in your accounting software has some real advantages for you and your business. You may not be aware of how much time and efficiency are lost, trying to keep track of items in one system, when your items are located in various places. Being able to see where your in-stock items are located can help give customers a better idea of what is available to them. It also helps you get those items to your customers more quickly, all of which results in happier customers. When your items are tracked by location, it becomes easier to keep track of actual inventory quantities. This helps for your physical inventory counting process, as well as the process of determining what needs to be ordered. If you have inventory stored on a truck or other remote location, you can keep track of that specific inventory as its own location. Tracking that information tends to reduce the possibility of items disappearing without explanation! Red Wing Software accounting software products are able to help you manage multiple locations. For more information, call Red Wing Software at 800-732-9464. How Do Red Wing Software Customers Feel about Aatrix for Payroll Tax Filing? Red Wing Software Payroll Programs use Aatrix as a provider of payroll tax reports and filing options. This feature is integrated directly into the payroll programs. Payroll tax reporting is a crucial component of payroll software which can have a direct impact on your processes. We checked in with Bruce Senti of Aatrix this month, and in this post he shares survey results and other information about customers using Aatrix. Aatrix has asked their customers opinion on their performance every year for six years. The response has been amazingly consistent. Below is a brief comparison of desired features in a W-2 eFile solution and the responses to the 2012 Aatrix W-2/1099 eFile survey. The best measure of overall satisfaction of any service is whether customers would recommend that service to other businesses. 93% of Aatrix’s customers say they would recommend the service to others. Processing W-2s is one of the most important requirements businesses face every year. It is the time of year many payroll administrators dread for obvious reasons. Complete W-2 eFiling services can eliminate most of the pain associated with processing W-2s in-house. In the past these services were provided by payroll service providers and were often very expensive. The addition of complete eFile services to many payroll software solutions has made this option very affordable, and offers significant efficiencies to small businesses. What to look for in a W-2 eFile solution. When determining whether a complete W-2 eFile solution is the right choice for your business, there are key features to look for. The solution should be integrated with or connect to your payroll software to improve the ease of processing W-2s and the accuracy of the filings. Getting set up for the service should be simple and easy to complete. The process should be easy to follow and understand. Below are the results of the 2012 survey of Aatrix eFile customers. The results were compiled from over 1800 businesses that responded to the survey conducted in April 2012. 97% of Aatrix’s customers agreed that the Aatrix solution worked well with their payroll software. 95% of Aatrix’s customers agreed that the Aatrix process was easy to understand. 95% of Aatrix’s customers agreed that the Aatrix enrollment process was easy to understand and complete. The service must be affordable. Typical in-house cost of processing W-2s is from $3.85 to $4.35 per employee. This cost includes processing time, forms, envelopes, and postage. 98% of Aatrix’s customers agreed that the Aatrix solution is affordable.